And gentry of the best. Nor bestow upon the poor. Or with hunger starve I shall. But with hunger starve you shall. For Jesus Christ his sake. But flung their whips away. But licked his sores away. His soul therein to guide. Hell's pains will never9 pass. 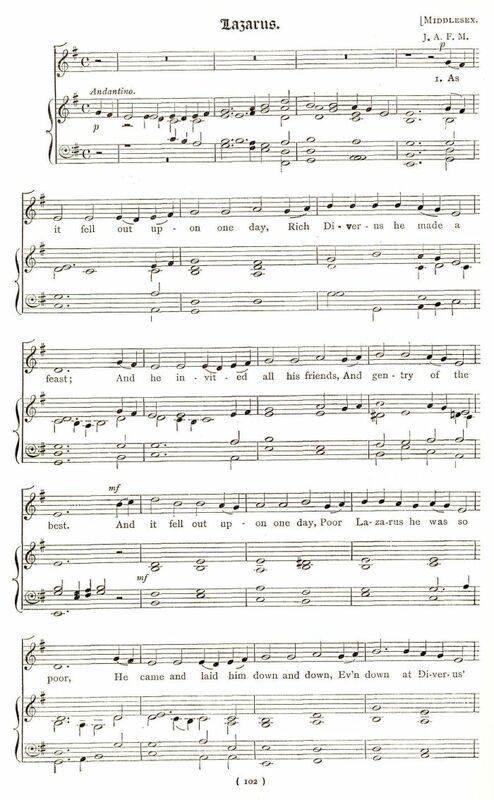 Sheet Music from Richard Runciman Terry, Two Hundred Folk Carols (London: Burns Oates & Washbourne Limited, 1933), #33, pp. 58-59. Sheet Music from Lucy E. Broadwood and J. A. Fuller Maitland, English Country Songs. (London: The Leadenhall Press, 1893), pp. 102-103. To sit upon a serpent's knee." The idea of sitting on the serpent's knee was, perhaps conveyed to the poet's mind by old woodcut representations of Lazarus seated in Abraham's lap. More anciently, Abraham was frequently drawn holding him up by the sides that he might be the better seen by Dives in the fiery pit. This carol is included in Hone's list of carols in his possession which were in use at the period he wrote -- 1822 [See: Christmas Carols now annually Printed]; but it was never printed in any collection until 1860 [Sylvester]. Hone speaks of the ludicrous effect produced by the thirteenth verse, "when the meter of the last line is solemnly drawn out to its utmost length by a Warwickshire chanter, and as solemnly listened to by the well-disposed crown, who see, without difficulty, to believe that Dives sits on a serpent's knee." "The idea of sitting on the knee," he adds, "was perhaps conveyed to the poet's mind by old woodcut representations of Lazarus seated in Abraham's lap. More anciently, Abraham was frequently drawn holding him up by the sides, to be seen by Dives in hell. In an old book (Postilla Guillermi, 4to, Basil, 1491) they are so represented, with the addition of a devil blowing the fire under Dives with a pair of bellows." The idea may have been conveyed to the writer's mind, as Hone suggests, or it may be that the serpent's knee was only thought of as antithetical to the Angel's knee on which Lazarus was to rest. The carol is now given from a sheet copy printed at Worcester in the last century. The composition is much in the style of a sixteenth century ballad, but the last verse conveys an idea of greater antiquity, as it seems to give expression to the opinion that the devotion of worldly goods to pious or charitable uses sufficed to avert future punishment. 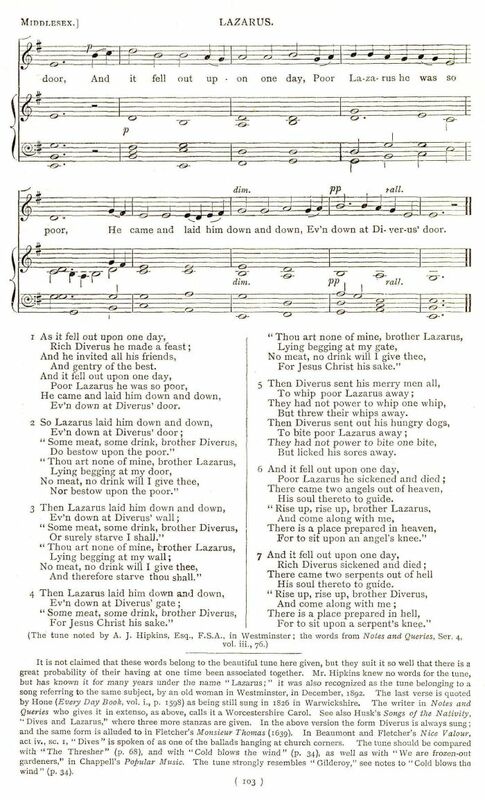 There can be little, if any, doubt of this being the piece referred to in Fletcher's comedy of "Monsieur Thomas," where a fiddler is introduced, enumerating the songs he can sing, amongst which is "the merry ballad of Dives and Lazarus." Lucy E. Broadwood and J. A. Fuller Maitland, English Country Songs. London: The Leadenhall Press, 1893. 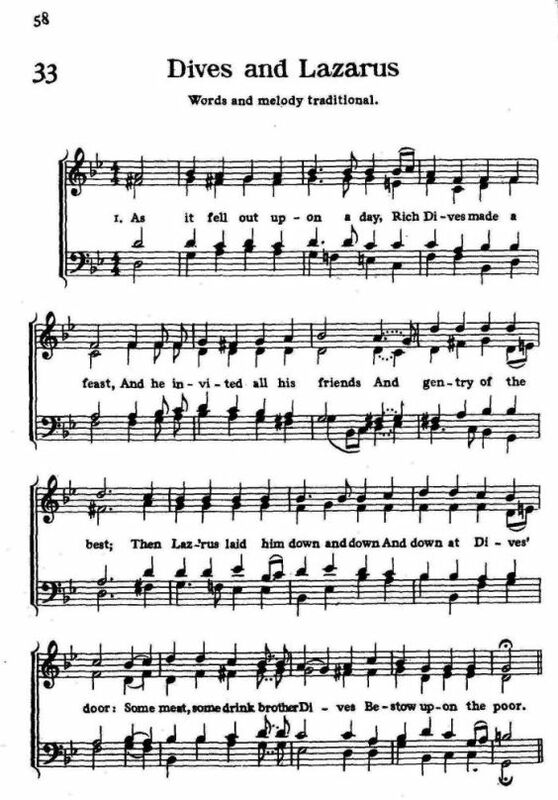 The tune noted by A. J. Hipkins, Esq., F.S.A. in Westminster; the words from Notes and Queries, Ser. 4, vol. iii., 76. It is not claimed that these words belong to the beautiful tune here given, but they suit it so well that there is a great probability of their having at one time been associated together. 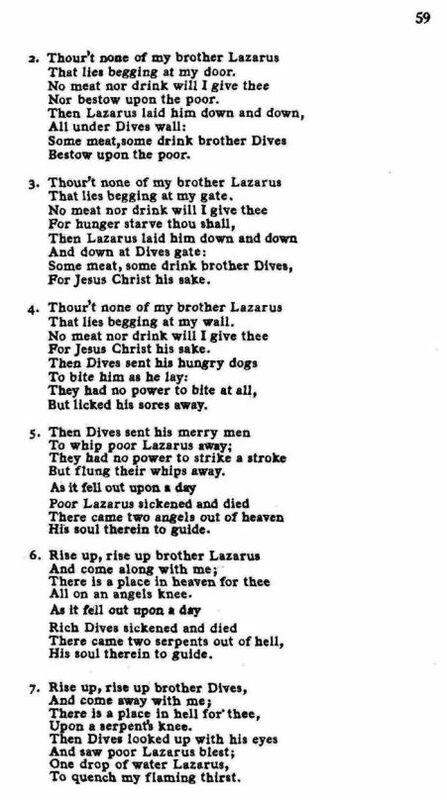 Mr. Hipkins knew no words for the tune, but has known it for many years under the name "Lazarus;" it was also recognized as the tune belonging to a song referring to the same subject, by an old woman in Westminster, in December, 1892. The last verse is quoted by Hone (Every Day Book, vol. i., p. 1598) as being still sung in 1826 in Warwickshire. The writer in Notes and Queries who gives it in extenso, as above, calls it a Worcestershire Carol. See also Husk's Songs of the Nativity, "Dives and Lazarus," where three more stanzas are given. In the above version the form Diverus is always sung; and the same form is alluded to in Fletcher's Monsieur Thomas (1639). In Beaumont and Fletcher's Nice Valour, act iv. sc. 1, "Dives" is spoken of as one of the ballads hanging at church corners. The tune should be compared with "The Thresher" (p. 68), and with "Cold blows the wind" (p. 34), as well as with "We are frozen-out gardeners," in Chappell's Popular Music. 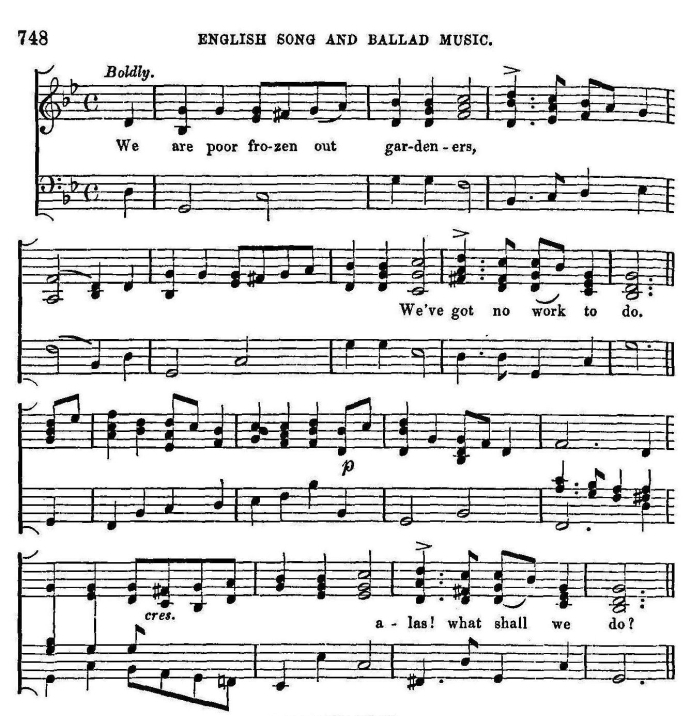 [See below] The tune strongly resembles "Gilderoy," see notes to "Cold blows the wind" (p. 34). From which thou canst not flee. Aside from this difference, the version given by Bramley and Stainer largely tracks with that given by Sylvester. As noted above, A Good Christmas Box has a verse 13 that is almost the same as given by Sylvester. To set upon a serpent's knee." However whimsical this may appear to the reader, he can scarcely conceive its ludicrous effect, when the "serpent's knee" is solemnly drawn out to its utmost length by a Warwickshire chanter, and as solemnly listened to by the well-disposed crowd, who seem, without difficulty, to believe that Dives sits on a serpent's knee. The idea of sitting on this knee was, perhaps, conveyed to the poet's mind by old wood-cut representations of Lazarus seated in Abraham's lap. More anciently, Abraham was frequently drawn holding him up by the sides, to be seen by Dives in hell. In an old book now before me, they are so represented, with the addition of a devil blowing the fire under Dives with a pair of bellows. Editor's Note: The following notes is from William Chappell, The Ballad Literature and Popular Music of the Olden Time. London: Chappell & Co., 1859, pp. 747-8. We Are Poor Frozen Our Gardeners. "This is the tune of many songs. If the reader should meet any half a-dozen men perambulating the streets of London together, and singing, the probabilities are great that they sing to this tune. Sometimes the men are dressed like sailors; at other times they look like workmen out of employment. I recollect hearing the tune at Kilburn, full forty years ago, and have, with tolerable annual regularity, ever since. I regret never having stopped to hear the words."